There are pros and cons to an open front barn. I think I’ve solved the con- in this case, even though it faces south, cold air, snow and rain still blow in during the worst storms and the wind just makes it miserable. Cold is one thing, cold wind is another. On the left hand side the gate to the barn is holding the tarp open enough for the girls to get inside. This gate will be closed more during bad weather and with grommets along the bottom of the tarp, it will help hold the tarp more securely with clips so it doesn’t flap about so much. The right side gate is completely closed as we have some round bales in there I don’t always want the girls to have free will at. But this gate can/will also be slightly opened during bad weather to allow them to come and go but still be sheltered. 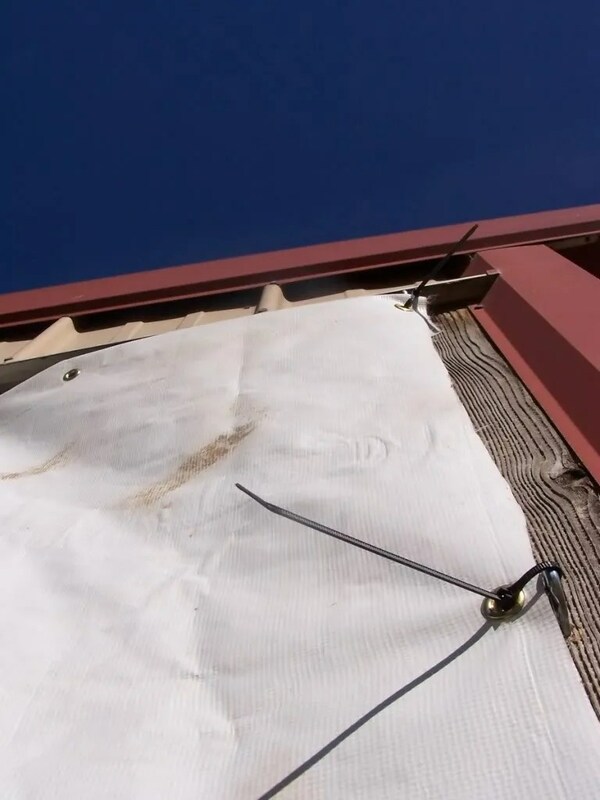 These tarps wont solve the cold problem entirely but short of a fully heated barn, which isn’t going to happen nor is it good for the animals anyway, this is the best it’s probably going to get. 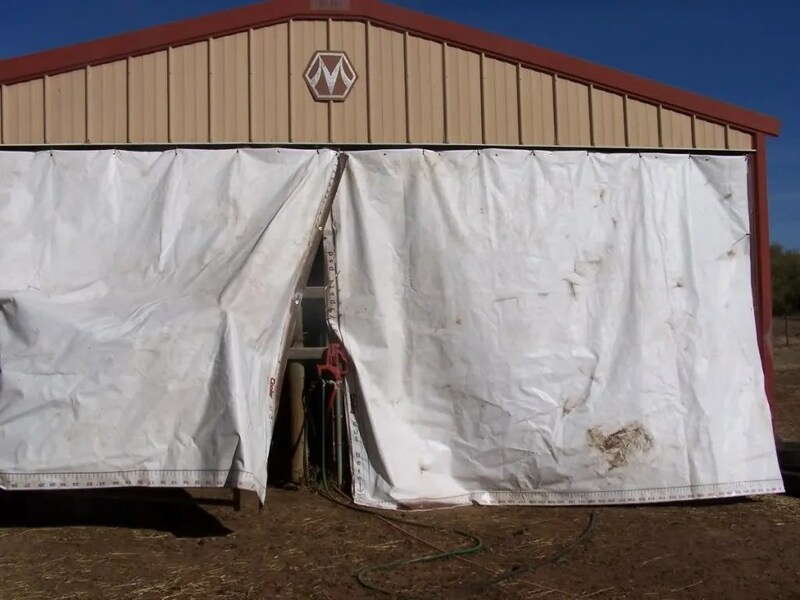 A friend of mine makes cattle panel hoop houses from these types of tarps. Believe it or not, they are actually used billboards. The funny thing, in my case, is that ironically the one we used for the front of the barn is an old Comfort Inn advertisement! It’s somewhat funny being on the inside seeing a huge Comfort Inn Logo and whatever catchy phrase they were using at the time to make you want to stay at their place. I should have gotten a photo of that! I feel badly for the bucks though as they’ll probably end up with a State Farm billboard and one of them has a not to attractive gentleman’s photo on it. Fortunately, I don’t think they’ll care =). These billboards were purchased from a company in Minnesota. If you’re interested, please message or email me and I’ll give you their name. They ask that you put the advertisement portion of the billboard to the inside or facing down (whichever is the case). These billboards come in several different thicknesses but generally they are about 13-17 mil’s thick on average I believe, and literally a fraction of the cost of similar at any farm store and will outlast any blue or grey tarp! Of course, they come in different sizes too. 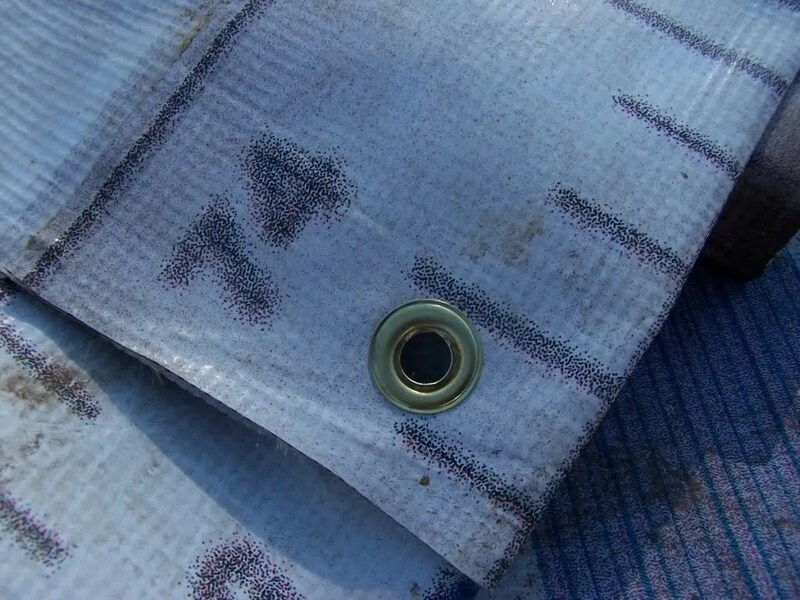 You will have to install your own grommets, as we did, if you need grommets but that’s a pretty simple and inexpensive task really.Though I do recommend you do it in the sun if it’s a cool day and forget about getting it unfolded if it’s cold! They need to heat up to be pliable, a simple chore when it’s warm out and there’s sun. An impossible task if it’s not which is why we wanted to get them up not rather than later. Eventually I’ll get enough clips to clip them to our installed eye bolts but for now, zip ties will due. We ran out of grommets too to put them down along the side which will keep them from flapping too much in the wind. I’d also like to make them roll up for nice weather and to air out the barn/allow sunlight in but we ran out of time to get that all hooked up. They’ll probably come down in the summer time to prolong their life and there’s no need for them during warm weather anyway. This is a task I can accomplish on my own as they are not so heavy that I cannot drag them to the grass to fold them up. The friend who uses them on her hoop houses is going on a 3rd winter with them and I believe they are out all year long. I probably could have cut off all the parts on the one side that have measurements on it but to be completely honest with you, as I did some of this alone, I wasn’t in the mood to making it look pretty. It’s functional, and it’s a barn and while I am not opposed to making things look nice, in the middle of a snow storm, I don’t care what it looks like if it works! This billboard was cut in half as we had used it to cover hay on a trailer during a bad storm and it was just too big to be efficient. Little did I know that if I had cut it in 3rds I could have gotten 3 tarps out of it instead of 2 and a 3rd that is seamed together but not matter, this can go up on the lean to and the grommets holding the 2 pieces together won’t make much of a difference. They’ll be peep holes, lol.